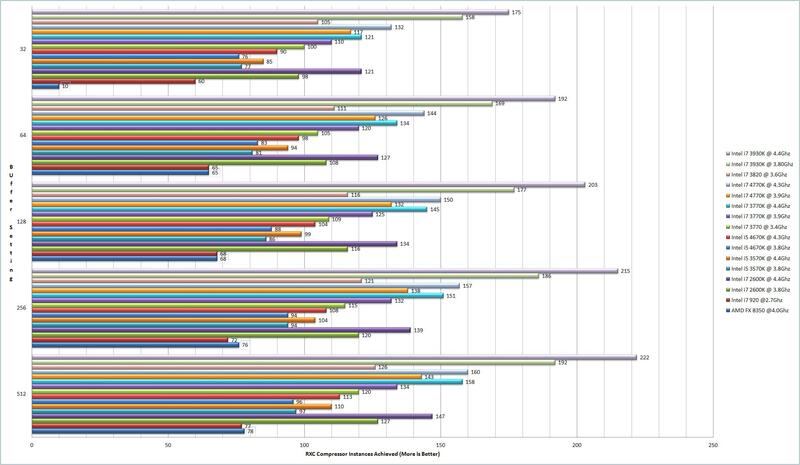 DAW Benchmarks 2013 – What gives you the best performance for audio applications? It’s been a good year or so now since we’ve managed to do a proper group testing session here in office on the system side of things and with the launch of a new processor selection it often raises any number of questions regarding upgrading or even replacing older setups with the newer chipset solutions. With the launch of Intel’s new Haswell CPU’s over the weekend and rumors reaching us of AMD’s latest CPU’s getting a solid performance boost it looks to be the ideal time to carry out a round up. During that time however the team over at DAWBench have updated and refined the basic test to allow for the performance heights that the new chips are reaching to be more easily measured. The new test doesn’t scale in quite the same fashion as the older version, so this time around it has required us to perform a full group retest to ensure everything is as accurate as possible on the chart, meaning that a number of older systems have dropped off the testing list due to the lack of available hardware or incompatibility with the newer testing environment. The other change of note this time around is with the interface being used by us for the task itself. In the past we used an internal RME card up until the point where external interface solutions became more common place, where we retired it and moved onto the Firewire budget champ in the shape of M-Audio 1614FW for our comparative testing. Over the last few years however Firewire support has waned and so it now makes sense for us to move onto a more everyday solution and one that is within easy reach of the average user. So with that in mind we welcome to the testing bench the USB based Native Instruments Komplete Audio 6 interface which itself weighs in at under £200 and should give a fair indication of what can be achieved by anyone with a good basic interface. Of course if you have invested in a more premium solution these scores will most likely be even better in your final setup but we hope to give people here a general idea on what can be achieved on the average DAW setup. So without further ado, on with the stats! You can click to expend the chart above and it gives us the testing results for the classic DAWBench RXC compressor test. The test puts a load on the CPU by letting us add compressor instances until the ASIO routine fails to cope and the audio breaks up. The first thing to note is down the bottom of the chart and AMD’s inclusion on the list. It’s the first time in a few generations now where we’ve seen a AMD chip hold it’s own in the benchmarking round up and overall it has to be said as a entry level solution it could have some legs. Pulling roughly the same benchmark results as the first generation i7 solutions when dealing with audio means that it offers a solid platform to work on for a price point somewhere in the £230 region for the chip and board. When doing the system math’s however for roughly 1/3rd more on the motherboard & CPU price you can have a i5 4670 Intel CPU and board which will give you roughly a 1/3rd more performance so the bang per buck in both setups is roughly the same at where we would choose to peg the entry level positions. It could however be argued that another £70 on what will likely be a £700 costing machine wouldn’t break the bank and could be a very worthwhile move in the long term as that 1/3rd more performance will more than likely come in handy further down the road and should be part of the consideration. Looking further up the range we see the comparisons between the 4670K & 4770K CPU’s and their predecessors which were the chips of choice at their respective performance points in previous generations. The 4670K is another unlocked i5 solution offering 4 cores whilst the 4770K is the direct replacement for 3770K midrange champion offering up the same 4 cores +4 cores of hyperthreading that have been available in the previous generations. For ease of comparison we made sure to test the key chips at both stock settings and with a fairly average overclock applied so you can see how they scale with the extra clock speed boost being applied. Even through the CPU’s don’t appear to overclock quite as far this time around we do see a fairly level increase in performance at around the 5% – 7% across the board when examining like for like CPU’s meaning that whilst not major game changers they do offer a step up on the previous generation. Regarding the chipset itself the big push this time by Intel has been the improvement of power saving features within the chipset and on the CPU itself. The inclusion of more C states which allow the PC to pretty much shut everything off when it conserves power is likely to be another major headache for audio system builders both pro and amateur alike so keep an eye on those and give them some consideration when tweaking up your rigs. The CPU microarchitecture has also been worked upon and whilst a lot of the changes are a bit more technical than we’d want to go into on article focused on audio applications, the expansion to the AVX2 instruction set may yield us further improvements in performance if software developers can make use of the improvements implemented in the Haswell release further along the line. We don’t expect it to be a quick process as it doesn’t make sense to focus on instruction tuning until it is supported by both Intel and AMD but we expect that to happen over the course of the coming year and once it does software companies often start to make use of the features in major updates which could be a nice benefit to those adopting the platform. Other benefits for adopters of the new platform include an increase of USB 3.0 ports available natively in the chipset (6 rather than the previous 4) and more Sata 6Gps ports which now total 6 natively over the previous generations 2 port solutions. So where does that leave us? Not much different from before the launch of the new CPU’s with performance scaling with cost right up to the hexcore 3930K chips on a pretty reasonable cost to performance curve. The current highend extreme in the shape 3970X however continues to break that curve rather abruptly although this is something most users have come to expect and thankfully it is only the most demanding of users that will even need to consider that solution as the rest of the range offers a lot of performance which will satisfy the vast majority of current requirements. The future promises us a new high end platform later in the year in the shape of IvyBridge extreme, although details and release dates are still very hazy we’re looking forward to getting to grips with those when they do eventually land. Right now through the Haswell solutions offer a great upgrade for any users of the first generation i series CPU’s (the 4th generation 4770k offers twice the performance in benchmarking of a first generation i7 920) or earlier solutions and continue to dominate their respective price points in the performance stakes. Previous PostUniversal Audio and Thursdays Webcast……Next PostBest Thing I’ve ever used for recording Acoustic Guitars……..